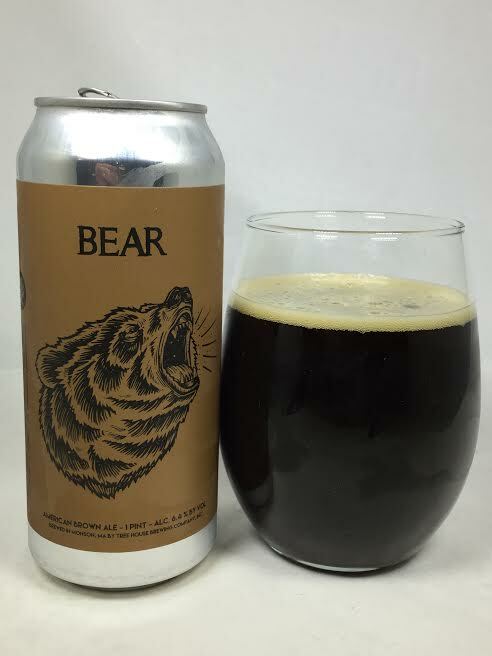 "Nearly four years in the making, Bear is Tree House brewer Brendan’s recipe and his first scaled commercial batch. It has all the characteristics of a classic English Brown Ale with a distinct American twist. Bear pours a nearly opaque dark brown with a sticky caramel colored head. Aromas of toffee, caramel, chocolate, and earthy hops prep the palate for the wonderful flavor to come. We taste toffee, brown bread, caramel candy, varied nuttiness, and a melange of dark fruit. The earthy hops dance throughout and are balanced beautifully by a brown sugar sweetness. Delicious. Bear is one of the best food beers we have ever had - it pairs brilliantly with nearly everything… including nothing! A lovely and unique example of a brown ale and one we are quite proud of Brendan for creating! Brewed in honor of those who leave a lasting and influential impression on our lives." Pours pitch black into the glass, but glows a deep mahogany red when it sits. I got less than a finger of khaki-colored head. Shows signs of a classic porter on the nose with notes of dark coffee, but it also has some nuttiness with touches of molasses and wood. A nice malty quality rounds it out. Dark fruits are more prevalent on the taste as raisins and figs come out first which add a quad-like feeling to this. The malts are what shine brightest for me as does an earthy hop presence with a good amount of bitterness. I don't think they used smoked malts in this, but I am definitely getting a smokey flavor reminiscent of sitting next to a bonfire. It isn't on a Rauchbier level of smoke, but it is easily noticeable. Nutty qualities are subtle, but still detectable, but I wish they were bolder and contributed more flavor. Concentrating hard enough, I do get a dessert-like chocolate syrup mixed in with everything else. Is it weird to say it tastes like the Fall? Because that's how I'd describe it. Mouthfeel is silky and smooth. It's light on the carbonation, but that helps create the mouthfeel. Some of those malt flavors overstay their welcome, but I can let it pass. Brown Ales aren't really known for blowing wind up your dress, but this offering from Tree House has a bit more complexity that what you'll find on your local shelves. I like the dark fruit component as well as the abundance of smoke and char. It's a nice change of pace from Tree House's hazy juice bombs.